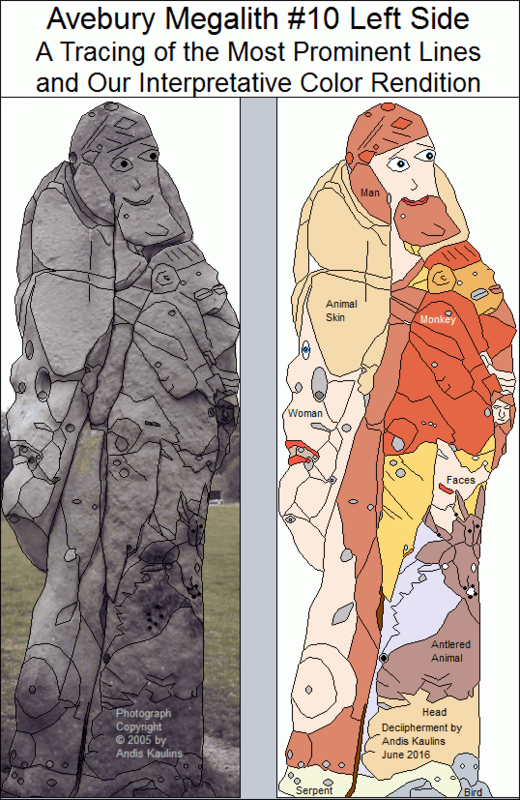 This is the tracing result for the left side of Avebury Stone #10, also shown in color. Everyone will trace this stone somewhat differently, but the basic substance will still remain. and especially for content-related research, teaching, and educational use in general. maker. Have fun! and learn thereby to better understand our ancient human ancestors! Everybody loves a good mystery and ancient megalithic sites contain many secrets. But who really wants the true purpose of these stones to be revealed? The solution of prehistoric riddles brings little short-term gain. Quite the contrary, any sensible interpretation of sites such as the “Avebury Henge” may even threaten vested interests that make a living from ancient studies and related disciplines. For example, old-school Archaeology (read Imre Lakatos) is antiquated methodologically and simply outdated. Why have mainstream approaches made only small progress in understanding prehistoric megaliths? One reason is that research involves picture-based "megalithic art" -- an art composed of figures and markings on stones. Some figures and markings are clear. Others are unclear, so that identification raises subjectivity issues and makes interpretation problematical. Detail-trained persons such as watchmakers, medical image or miniature art specialists – not archaeologists -- should independently trace (and check) lines, markings and figures on megalithic photographs to arrive at some common base of discussion. Even then, if figures and markings are apparent, disputes can still arise as to whether these are man-made or natural. Moreover, one must consider that some stones are partly defaced by modern graffiti. One stone is not enough! The evidentiary process of identification and interpretation of figures and markings as astronomy depends upon internal proof that such figures and markings are part of an ancient “system of notation”. That system must be apparent on individual stones at the site, at neighboring megalithic sites, or even as part of a "megalithic plan" involving more distant megalithic locations. If, for example, figures and markings on a given stone are said to mark a certain region of stars in the sky, then the marking of neighboring stones must “fit” logically to the stars so identified, and must mark systematically predictable stars in the sky, so that the entire system can and must -- in essence -- “prove itself” internally. Avebury does so. Of course, other proofs are also possible, such as artefacts similar in artistic design to the materials under discussion. For example, the otherwise virtually unknown Accession Number 60.145.11 at the Metropolitan Museum of Art in New York City was found online after our completion of the decipherment of Avebury Stone #10, a stone which has a similar motif on its left side (left as seen henge-outward). Accession Number "60.145.11" is pictured below in our own illustrative approximate drawing and will be discussed subsequently in examining the left side of Avebury Stone #10. The megalithic style of art by which "real" hand-worked megaliths can be distinguished from natural stones is the "prehistoric style of relief carving composition", whereby smaller figures are drawn within larger figures, i.e. a figure within a figure within a figure. Indeed, smaller figures were often carved within larger ones to the smallest degree. There are sometimes many more figures carved on the stones than we actually mark, because otherwise the larger figures would be virtually blotted out in our drawings. There is no guarantee that these figures were all astronomical. However, we think that many are, conforming to a principle of hermeticism of Hermes Trismegistus, famously known, "as above, so below", whereby the ancients used the readily available "map" of the stars above to navigate and mark their way on Earth, both in terms of space (navigation, territorial viz. geographic orientation) and time (calendration). The prehistoric artistic method thus used is reflected in the ancient mythology contained in the Latvian Dainas (http://www.lexiline.com/lexiline/lexi54.htm) and Teikas (http://www.lexiline.com/lexiline/lexi81.htm), with similar mythology also found among the other Baltic peoples, the Lithuanians and Estonians. Proto-European prehistoric peoples wished to "fill" stones with life, for the ancients were puzzled that "stones did not grow" as other things in nature did. Modernly, of course, "life" or "not life" is similarly still the "essential" difference between organic and inorganic chemistry. Our understanding has become more sophisticated over the millennia, but the basic essence of primordial questions about life remains. The ancients first selected a stone (or separated it away from a larger source at a quarry) that had the approximate size and the shape that they wanted to have. In some cases that stone also had to have a particular color or texture (e.g. the blue speckled Preselli "Moon stones", chosen for their speckles -- so we allege -- for their similarity to the starry sky at night). Subsequently, the ancients carved the large stone into a somewhat finer large figure. That shape could be e.g. 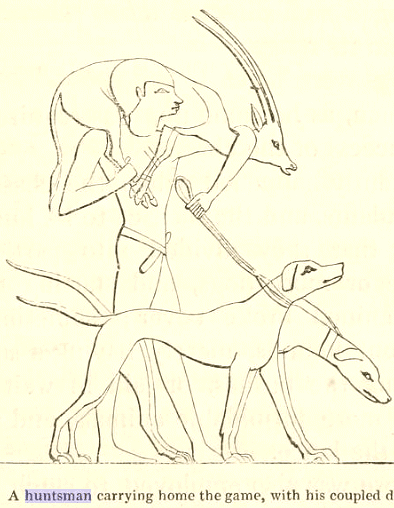 a human head (often more than one), but it could also include animal heads and shapes. One presumes that such carved figures or heads were intended to represent the stone makers themselves, or other persons or VIPs in the community and family. On that overall surface, the ancients then carved more figures representing large star groups, adding markings for the stars that represented those figures. These markings were often very faint lines outlining the shapes of carved shapes and variously sized holes, viz. cupmarks (cupules) representing the stars. On weathered stones, lichens sometimes cover shallower indentations in the stone, which are thus still apparent to the naked eye, but proving that such indentations were intentionally made is of course difficult. As a general rule, the larger the hole or cupmark (cupule), the brighter the magnitude of the star. Weathering, however, can have changed the size of holes, so absolute conclusions here can not be made. Accordingly, the general difference in the size of markings can only be taken as a rough guideline for the magnitude of the stars that the ancients portrayed. The ancients were sometimes also drawn to geometrically-shaped groupings or "swarms" of faintly visible stars, and also to geometric shapes in the void spaces between star groups. The result is sometimes that initially insignificant-appearing smaller "details" carved on the stones can serve as critical evidence for the correctness of the identification of larger figures being portrayed. It all has to fit, like a puzzle. Also the shape of the Milky Way can be marked on stone. 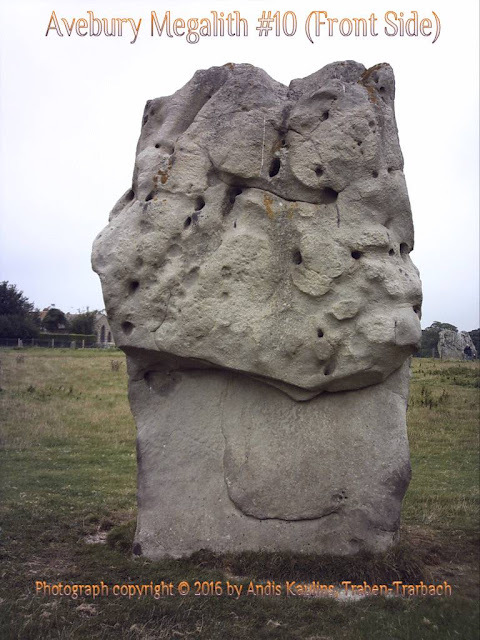 The front side of Avebury Stone #10, for example, provides us with excellent examples of the importance of examining details. First, there is the strange shape of the stone. Then there is the unexpected shape of a leg and a foot on the lower half. A significant color difference exists between the top and the bottom of the stone on the back side. As we discovered, this was not chance, but was used by the ancients on the back side to portray a respective portion of the Milky Way. Initial tracings of Avebury Stone #10 showed head-like shapes toward the bottom of the megalith. Once an initial hypothesis about the stars represented on the stone had been made, it then became quite clear that these shapes were intended to mark the edge of the Milky Way. One "deciphered" stone side is not enough. One can sometimes find any number of alleged figures on a given stone – but are they really there at all, or if present, are they there by human design, and are they significant for astronomy? We thus proceed to examine further markings on other sides of that same stone and on neighboring stones. The probative value of any stone depends upon the weight of "the preponderance of the evidence" as provided by additional pieces of evidence. For example, we identify markings on the front side of Avebury Stone #10 to mark the position of the Summer Solstice in ca. 3000 to 2500 B.C. in the stars (not the same as Solstice or Equinox risings). That location in the stars turns out to be Leo. 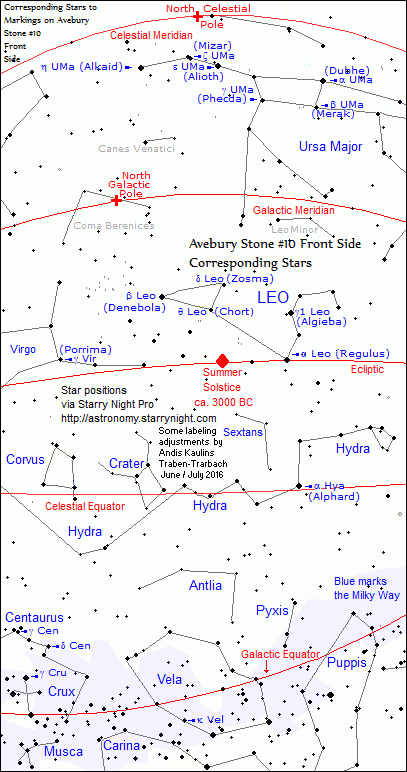 Stars on that solstice colure (line) and stars neighboring Leo are also marked on the stone. We recognize that one such identification standing by itself means nothing as a matter of probative evidence. However, it gives us a point of reference: we have a starting point. If the remaining sides of the stone as well as neighboring stones fit into this initially suggested system, then the preponderance of evidence could be considered to be overwhelming – and it is. 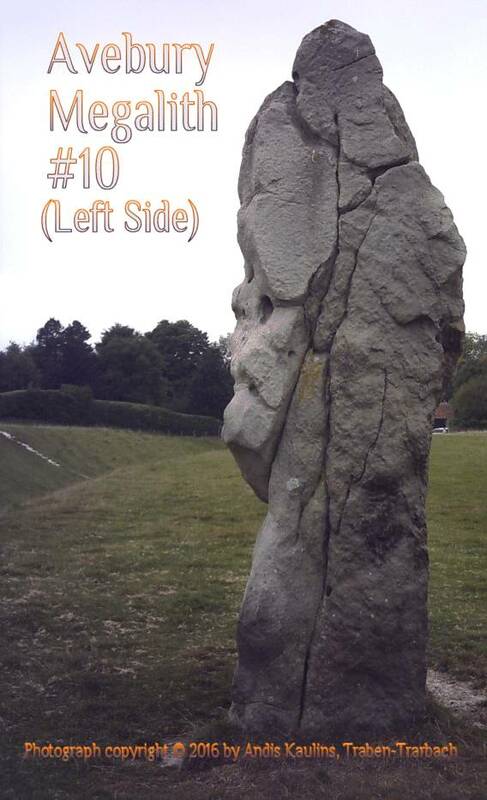 Starting at the next posting, we turn to the left side of Avebury Stone #10. And now we come to the really fun part of the entire decipherment process, because we begin to use a major test of the scientific method -- the test of prediction. then the left and right sides of Avebury Stone #10, of which we previously published our photographs, MUST by shapes, lines and carvings, mark the stars viz. star regions to the left and right of the stars shown in our previous posting, while the back side of Avebury Stone #10 must mark the stars opposite those identified on the front side of that stone. As luck would would have it, the relatively narrow left side of Avebury Stone #10 is on the whole so clear in its shapes, lines and markings that even persons in the archaeological professions who have no knowledge of astronomy as also persons in the astronomical profession who have no knowledge of archaeology should be able to see that our prediction is correct. The left side of Avebury Stone #10 marks star regions as predicted. The right side of Avebury Stone #10 marks star regions as predicted. The back side of Avebury Stone #10 marks star regions as predicted. The neighboring stones show stars to the left and right of those identified on the front side of Avebury Stone #10, as one would expect. We show this in the subsequent postings. Modernly, we look at this star map. 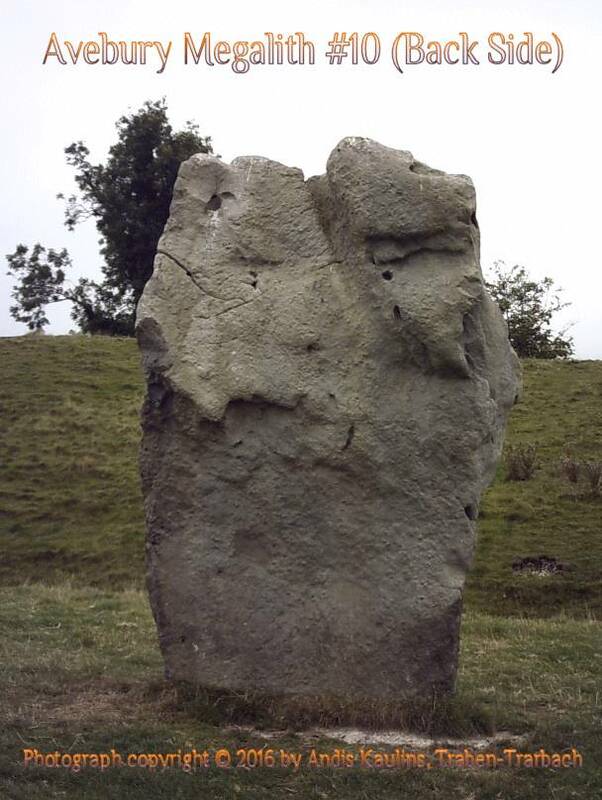 At Avebury, you looked at Stone #10. Stars and astronomical parameters represented on Avebury Stone #10 are shown here on a sky map clipped from the astronomy software Starry Night Pro, http://astronomy.starrynight.com/. Labeling adjustments and text explanations are by Andis Kaulins, who is unaffiliated with Starry Night Pro. The underlying sky map here is clipped from the astronomy software Starry Night Pro, http://astronomy.starrynight.com/, using the GPS of Avebury as the location setting. We set the date to ca. 3000 BC and use Starry Night Pro's "white sky" setting, which makes the stars easier to locate on the screen. We changed the color of all the major astronomical parameters to red, as all of those are marked on Avebury Stone #10 and are thus easier here for those to see who are not that familiar with these parameters. We also moved various labels around and changed the fonts and their sizes here and there so that they do not cover stars or other essential parameters. Note in the left-hand corner how ACrux, the brightest star in Crux, is right on the galactic equator, which also corresponds to the most southerly limit of Milky Way visibility in that era. ACrux disappears from visibility soon after that era at the latitude of Avebury. 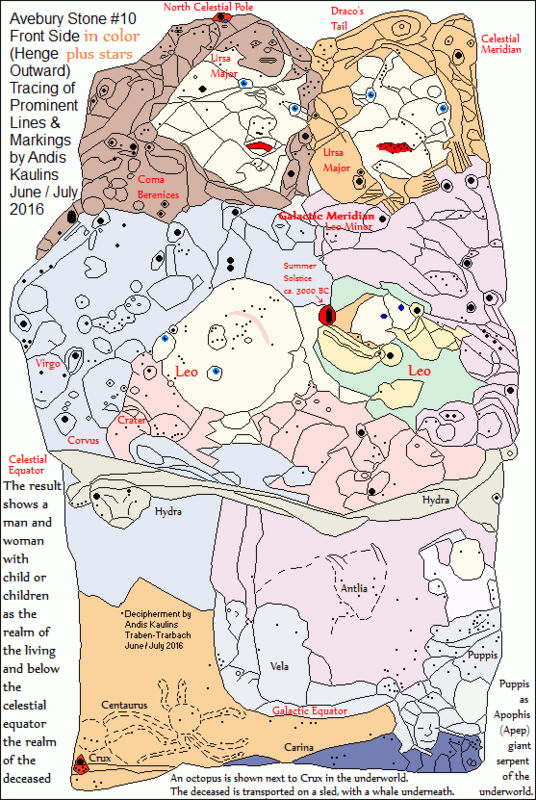 Note that the Summer Solstice is marked in the middle of the sky map image and corresponds to the middle of the front side of Avebury Stone #10. The Winter Solstice is similarly marked in the middle of the stone on the back side of Avebury Stone #10. Note how the line of the celestial equator is marked on the stone by the "overhanging" sheared stone. That is also the case for the back of the stone. Here on the front side the Milky Way is marked at the bottom of the stone. On the back side, the Milky Way is marked at the top of the stone, indeed in a lighter color. This is the color tracing result for Avebury Stone #10. 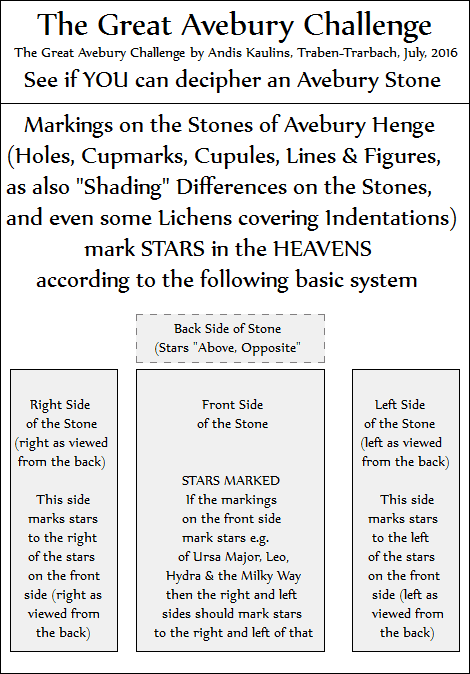 These are the stars marked on the black & white tracing for Avebury Stone #10. 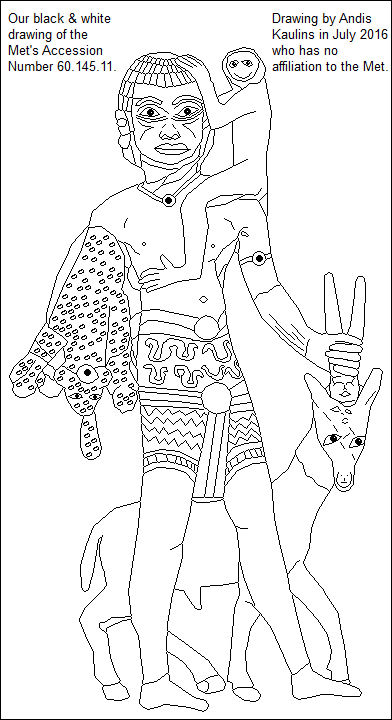 This is the black & white tracing result for Avebury Stone #10.
original photograph by someone else and further work such as coloring become the copyright of the maker. Have fun! and learn thereby to better understand our ancient human ancestors! 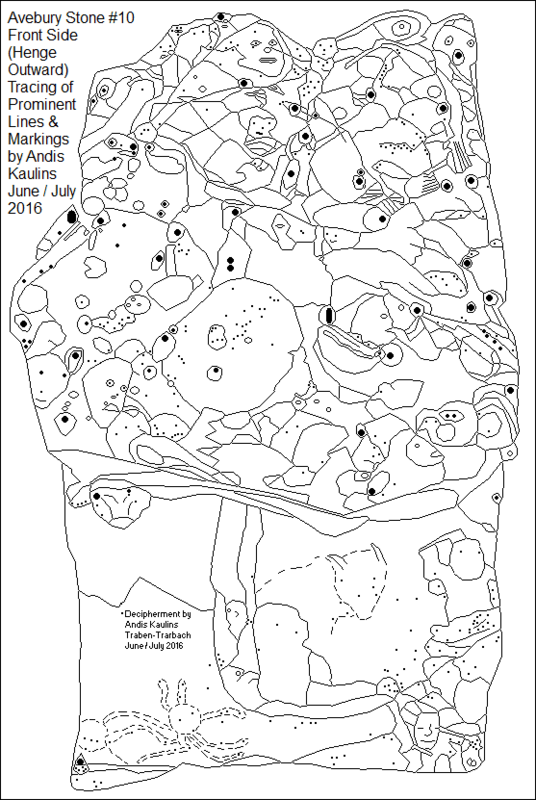 This is our tracing of the prominent lines and possible markings on Avebury Stone #10. Our tracing serves as our basis to further analyze the stone. Others should make their OWN tracing, based on the untraced photograph previously published. For starters.... and to flex your creative muscles.... This is a tough one. Could the whole stone be seen as a head facing either left OR right, with a pelt hat? The top half of the stone is lighter in color than the bottom -- is that difference intentional? Do you see the deep notches in the upper half? If intentionally cut, why was that done? Does the upper left half look like a camel head (or wing) and the right half like a bird's head? Does the bottom quarter of the stone look a bit like the outline of a boat? How many faces can you envision in the top half of the stone? large and small? photograph and further work such as coloring becomes the copyright of the maker. Have fun! and learn thereby to better understand our ancient human ancestors! Do you see a man's face with big eyes at the top? Bird or animal or both to his right? Is there a large head below that with perhaps a face looking forward or right? Do you see how the stone has been sheared at the right middle? Is that overlap intended? Do you see the darker lower part of the left side of the stone? Could one envision that to be a seal or some other water denizen? From this angle, is there a large bird lower right with a head left and wing right? Do you see a large woman's face and figure (or hair) profile facing left? Do you see a man's bearded head and figure at the right, possibly carrying something? Do you see another figure to his front, facing right? Are there any animal-like figures visible toward the bottom? Could the whole top half of the stone be seen as the crowned head of a king? also a couple? The whole top half of the stone projects out over the bottom half -- is that "line" intentional? Do you see the leg and foot in the lower half? What is that at the top of the leg? or bottom left corner? Could one envision the large head of a whale in the lower right half (Physeter macrocephalus)? Click on the photograph to see the photograph in original size. Avebury Henge in Great Britain is the largest ancient stone circle in the world. In spite of massive study over the years by mainstream academic and alternative researchers and despite countless publications about Avebury, people remain mostly clueless about one of humankind's greatest achievements, which has wrongly been relegated by many to the ranks of "esoterica". We hope to remedy that mistake shortly. The book is unfinished and can not be ordered yet. It will present our recent "decipherment" of the Avebury Stones of Avebury Henge and Circle. Aubrey Burl in the 1st edition of Prehistoric Avebury features the above Avebury Stone #10 in the foreground on the book cover, but it is pictured in a group of stones and is turned somewhat sideways. We picked this stone for our cover before ever viewing Burl's 1st edition because we discovered that it is the most important stone at Avebury, as we shall soon demonstrate. Since Burl was an experienced megalithic researcher, his initial instincts must have told him that Stone #10 was important. The 2nd edition of Burl's book features a less important stone in the foreground with a side view of Avebury Stone #10 in the background. Newer may not be better. Good photographs are essential for analyzing ancient megalithic sites. 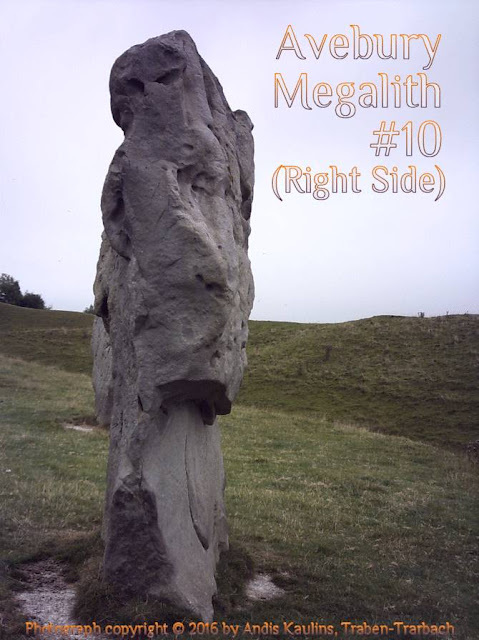 Some years ago on a visit to the United Kingdom, the present author took a series of close-up photographs of the Avebury Henge megaliths ("big stones"), photographing, as possible, many Avebury Henge stones from the front, the back and the sides. That posting series resulted in a unique, comprehensive collection of photos of the individual stones that thus far has no equal. Such photographs were necessary for our decipherment of this prehistoric megalithic site. No such published collection of photos was then available because -- regrettably -- the archaeological mainstream community is lax in their visual documentation of prehistoric megalithic sites. Avebury Henge is no exception, so that we had to "make our own", as it were. Who otherwise photographs the individual stones for the stones own sake? Most of the thus far available photographs of Avebury Henge tend to be "artsy-craftsy" in their focus, whereas a comprehensive photo overview of the individual stones themselves is lacking, even in sources published by the professionals. Indeed, the online English Heritage Avebury website has a picture gallery of only ten photographs total, most being "group" shots. By contrast, we for example present as many as four different photographs of just a single stone (front, back, left and right sides). Trying to portray Avebury in ten photographs is "minimalist", to say the least, and it reflects the disappointing state of the art of most academic Avebury research and presentation. One happy exception here is Secrets of the Avebury Stones: Britain's Greatest Megalithic Temple by George Terence Meaden, which has some excellent photographs of individual stones, but generally only one stone side only. Meaden correctly sees carved faces on some of the stones. As we shall demonstrate, there are are many more carved figures on the stones. Many of these, however, can properly be identified only by tracing the most prominent lines on photographs of the stones and then analyzing the stones via zoom and other functions via graphic image photo software tools. 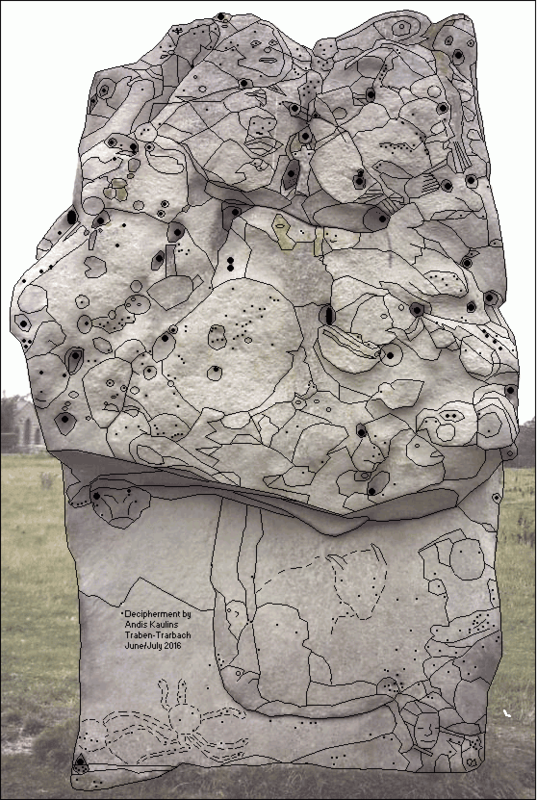 Another important book on Avebury is Nicholas R. Mann's Avebury Cosmos: The Neolithic World of Avebury henge, Silbury Hill, West Kennet long barrow, the Sanctuary & the Longstones Cove. Mann does not analyze individual stones as such, but rather stone groups. His analysis adds a new approach to what he regards as a now established archaeoastronomical fact that the builders of Avebury were sky-watchers and that Avebury Henge was astronomical in nature, with Crux, the Southern Cross, playing a leading role at a time when sky observers at Avebury could see the entire Milky Way. We might add to that the important observation that the star Alpha Crucis is located directly on the Galactic Equator at the thinnest part of the Milky Way. The stones show that the ancients knew the position of the Galactic Equator. "Crux lies in the Milky Way, -- here a brilliant but narrow stream three or four degrees wide ... the general effect being that of a badly made kite rather than of a cross." "[Vespucci] did not identify it as a cross; rather he described its pattern as a 'mandorla,' that is, as almond or vesica shaped. It is plausible that the early British sky-watchers also saw it in this manner...."
That may in fact be the case on Avebury Stone #10. "Since Acrux is ... the southernmost first-magnitude star, it is [currently, in our era] only visible south of latitude 27°N.... Because of Earth's axial precession, however, the star was visible to ancient Hindu astronomers in India who named it “Tri-shanku”. It was also visible to the ancient Romans and Greeks...."
[Crux] was last seen on the horizon of Jerusalem ... about the time that Christ was crucified. But 3000 years previously all its stars were 7° above the horizon of the [peoples] along the shores of the Baltic Sea, in latitude 52°30'. The latitude of Avebury is slightly below that, between 51° and 52° North. In our forthcoming book, we shall publish not only our original comprehensive photographs of the stones but also our interpretation of the significance of these monumental megaliths - most estimated at 40+ to 100+ tons in size. Our photographs and illustrations are being published for non-commercial "fair use" in research and education. We hope that our work and our photographs, illustrations, and interpretations will help to put to rest once and for all the erroneous mainstream archaeological view that the Avebury Stones were not much "worked" by human hand and that they allegedly do not have carved figures or other man-made markings on them, manifested as lines, holes and cupmarks (cupules). In fact, some of the "markings" are quite creative, and Avebury Stone #10 will provide ample evidence of that. Given all our foregoing postings on Avebury, you have obtained essential information needed to decipher the Avebury Stones of Avebury Henge, presuming you want to try your hand at experiencing the thrill of discovery. For those not so interested, after presenting the four photographs of Avebury Stone #10, we will present our various drawings and illustrations together with accompanying text to reveal our own decipherments of Avebury Stone #10 as Archaeology, Art & Astronomy. The choice is yours. As a Stanford University Law School graduate, the present author was pleased to read in the Scientific American at Science Research Needs an Overhaul, that John P. A. Ioannidis has co-founded a new center at Stanford University called METRICS (Meta-Research Innovation Center at Stanford) to deal with the costly problem that much mainstream research is wasted. Ioannidis cites to The Lancet, which avers this applies even to 85% of medical research, a "hard" science. So how bad are things in the soft sciences? We enthusiastically applaud this development. We have been confronted for years by gullible, uninformed, and opinionated people in and out of science proclaiming the near infallibility of mainstream ideas and research methods and we really have little patience for it. Having taught research ourselves at the university level, we know from experience that exactly the opposite is true: most of what is researched in science and is peer-review published as a result is a costly waste of time and often leads science in the wrong directions. It serves people's vanities. One main reason for these follies of "scientific research", as we have written time and time again, is that science in the past has been predominantly "authority-based", i.e. it is not "what" but rather "who" determines the truth, whereas we think that "evidence-based" research must be given priority. Outdated memes must be abandoned. That is our quest. Meme is a term coined by Richard Dawkins, emeritus Professor for Public Understanding of Science at Oxford University in England. Memes are by his definition: "replicated ideas, symbols or practices". We view memes as describing the state of mainstream science at any given time. Indeed, memes explain many of the aberrations of science. "[A]n idea, behavior, or style that spreads from person to person within a culture." A meme acts as a unit for carrying cultural ideas, symbols, or practices that can be transmitted from one mind to another through writing, speech, gestures, rituals, or other imitable phenomena with a mimicked theme. Supporters of the concept regard memes as cultural analogues to genes in that they self-replicate, mutate, and respond to selective pressures.... The word meme was coined by British evolutionary biologist Richard Dawkins ... as a concept for discussion of evolutionary principles in explaining the spread of ideas and cultural phenomena. Examples of memes given [in The Selfish Gene] included melodies, catch-phrases, fashion, and the technology of building arches." In our view, what is normally called a "school of thought" in academia is more accurately defined as being a "meme", because "thought" often has nothing to do with it. Ideas -- whether right or wrong -- become entrenched in various disciplines of science and propagate themselves as if they had a life of their own. The same is true for politics and religion. Truth is not at all at issue. "Memetics is a theory of mental content based on an analogy with Darwinian evolution.... Proponents describe memetics as an approach to evolutionary models of cultural information transfer.... As with genetics, particularly under a Dawkinsian interpretation, a meme's success may be due to its contribution to the effectiveness of its host." In other words, and contrary to the notion that "truth" is the objective in science or elsewhere, people thus actually adhere to a given idea, school of thought, cultural practice or religion because the adherent of a particular meme perceives it as providing the holder of that meme with advantages. That essential understanding helps to explain many of the backward ideas that are maintained in science. Presumably "rational" people are holding fast to long-outdated ideas and ways of looking at things, often at odds with the available probative evidence. We look to the probative evidence. Science must look forward. 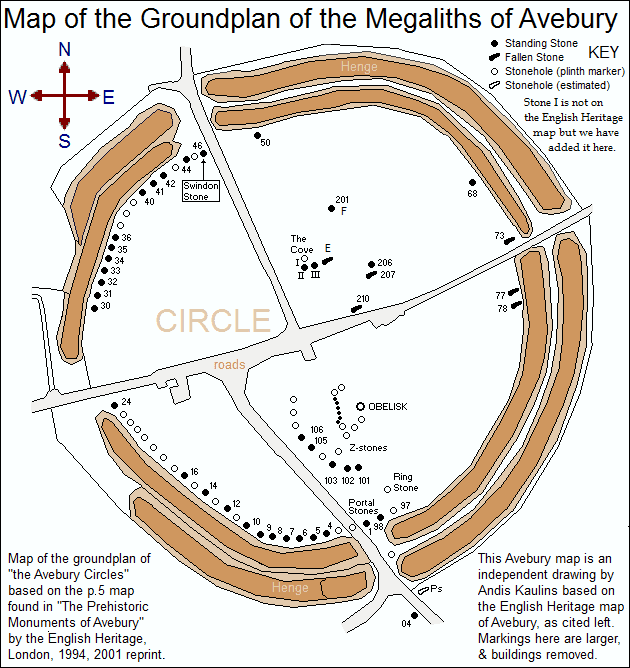 This posting presents two very necessary maps of Avebury Henge and Circles and the numbered Avebury Stones, which numbers we use throughout our Great Avebury Challenge postings. The first map shows the layout of the stones and the second map is our discovery of the geometric foundation. 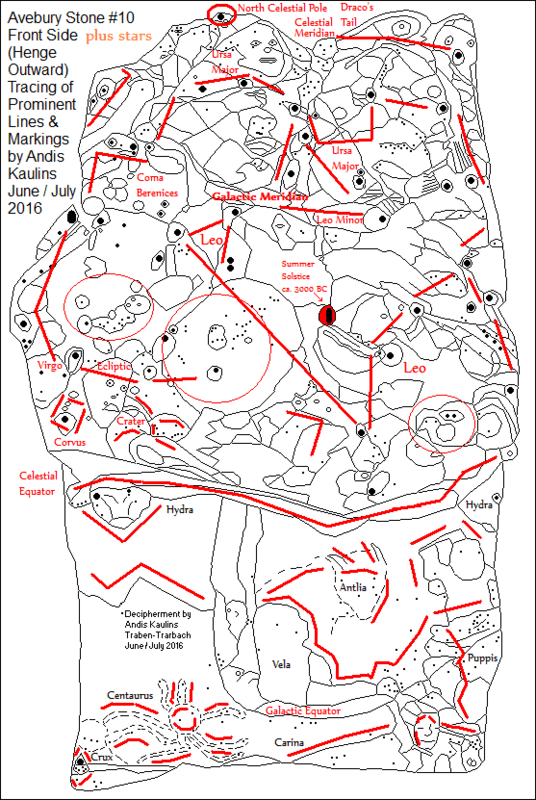 The above Avebury groundplan and numbered stone location map is an independent illustration by Andis Kaulins based on the English Heritage map of “the Avebury Circles” found in Caroline Malone, The Prehistoric Monuments of Avebury, English Heritage, London, 1994, reprinted 2001, https://www.amazon.com/Prehistoric-Monuments-Avebury-Caroline-Malone/dp/1850742537. Markings here are larger and the buildings have been removed. “North” is up and “South” is down. The upper right-hand corner KEY designates a map-numbered filled black dot as a standing stone, a filled black elongated horizontal symbol as a fallen stone, an empty black dot as a stonehole (plinth marker) and an empty horizontal symbol as a stonehole (location estimated). Stone I is not on the English Heritage map but is included here. Those keys are a bit changed from what is used by English Heritage as we think that our amended version is more easily understandable. Please not that we are not convinced that circle-essential stones belonging to the present circle of stones once filled the markers now marked with plinths. The reason for that will become self-evident as the stones are deciphered. Early in the decipherment process we discovered that Avebury Stone #10 marked the Summer Solstice point in the stars. Please note that this is not the same as "Solstice risings". 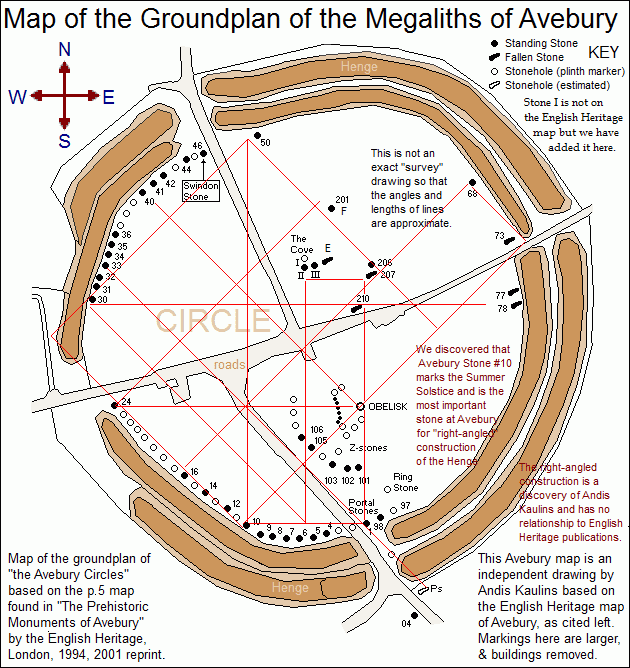 Pinpointing the likely astronomical significance of Avebury Stone #10 was of eminent importance for the process of understanding the original construction of Avebury Henge and its Circles. We drew a 45-degree line from Stone #10 through the Obelisk, leading to Avebury Stone #73, presuming it marked the Winter Solstice in the stars. Examination of angles and linear relationships showed that straight lines and simple 45° and 90° angles greatly explained much henge construction, tying together most of the important aspects of construction with just a few lines. One consequence of this geometric formation was the hypothesis that the earthwork part of the henge represented the Milky Way, seen as two adjoining strands with differing length ends, as in the sky (as above, so below) with the large opening to the West marking the Milky Way's thinnest, most open, part. That analysis further suggested that Avebury Stone #24 might mark Crux, the Southern Cross, which led this author ultimately to locate a seminal work by Nicholas R. Mann: Avebury Cosmos: The Neolithic World of Avebury henge, Silbury Hill, West Kennet long barrow, the Sanctuary & the Longstones Cove. Mann suggests that the Milky Way was an essential part of the stellar model that led to the construction of Avebury Henge, and we say that he is right. His main point is that the ancients had become aware of axial precession, which was "lowering" the sky, and, indeed, at the time of the construction of Avebury Henge, was dropping the stars of Crux, previously fully visible, slowly out of sight. A Milky Way that was previously fully visible to the ancients for thousands of years was now in part disappearing into the more southern world beyond the horizon. We recall here with more significance now a legend about the otherwise fearless ancient Old Norse that the only thing that they feared was "that the sky was falling". In truth, it was. In our decipherment of the Avebury megaliths, Avebury Stone #24 marks Crux. The Great Avebury Challenge - The Challenge - Can YOU Decipher an Avebury Stone Using Our Knowledge? That graphic above asks whether YOU can decipher an Avebury Stone on your own, using the above basic system. You may want to read our next dozen or so postings first to get into the spirit of things. According to our own recent decipherment of the Avebury Stones, soon to be published as a forthcoming book, these stones have markings on ALL sides consisting of holes, cupmarks viz. cupules or indentations, lines, figures, and even shading. The entire stones themselves also have special intentionally "designed" viz. "adapted" shapes, as we shall see in subsequent postings. The Great Avebury Challenge is made to professional and layman alike, professors, teachers at every educational level, students, pupils, and anyone interested in the subject. Can YOU decipher an Avebury Stone on your own using our knowledge? It is more difficult than you might expect, but we claim to have done it, so why not YOU. Share in the thrill. Give it a try, using the basic system above. In that system, we have found that the markings on the stones are astronomical in nature and present marvelous prehistoric art in design -- although one must be aware that not all markings that can be identified or imagined are certain by any means. The key is to get the essence of the markings, although details often offer valuable clues to decipherment. Much can be made more visibly apparent by tracing the most prominent lines and marks on photographs of the stones via appropriate "zoom-capable" software. We ourselves subsequently then use the "threshold" menu function in Paint Shop Pro 7 to reduce our tracings to a black and white outlined stone on which we then color apparent figures and assign the applicable corresponding stars. The "front" of a stone -- for the outermost "circle of Avebury Henge stones -- is the surface facing henge-outward. That front side in our decipherments represents a particular part of the sky in astronomical representation. The left and right sides of that same stone represent stars to the sides of the stars on the front face of the stone. The back of the stone (henge-inward) depicts stars above viz. behind or "opposite" the stars on the front side of the stone. Stone markings focus not only on one group of stars, but can also include neighboring groups of stars, and can also mark -- in a prehistoric way -- more sophisticated parameters that in modern astronomy are described as Solstices and Equinoxes, Celestial and Ecliptic Poles, the Ecliptic, the Celestial Equator, the Galactic Equator, and corresponding Meridians. A normal person can be satisfied with just trying to identify depicted stars. Our subsequent postings will provide you with our own decipherments of the Avebury Stones at Avebury Henge using our above basic system, starting with Avebury Stone #10, the most important stone at Avebury according to our research and decipherment work. To give everyone a chance to experience the thrill in discovery themselves, we will first publish only our photographs of a particular stone, without further detail or interpretation. You can use those photographs as the basis for making your own tracings and interpretations. If you are a teacher, let your students or pupils trace the most prominent lines and markings on a given stone. How similar do your results turn out to be when compared to ours? Our copyrighted photographs of the Avebury Stones will be released in those postings for free non-commercial "fair use" by the public. All commercial rights in the photographs are reserved by this author as the copyright owner. This means that you can -- but need not -- skip postings -- after the initial photographic publication. In those later postings we will be presenting our own decipherments. Since not everyone will be interested in this decipherment challenge per se, some may only want to know our decipherment results. BUT THERE IS A CATCH 22. ANYONE negatively commenting, or criticizing our work or having another opinion about the stones MUST produce their OWN tracings and interpretations of the stones for public inspection online. We provide the photographs. YOU, dear critics, now should do the work too, for all to see. Criticism is a piece of cake. Accomplishing something is quite a bit harder. We no longer communicate with institutions or people whose uninformed, unresearched and often simply ignorant knee-jerk opinions are based on long outdated memes -- and, indeed, a posting follows soon on such memes. So ... first trace the most prominent lines and markings on a given stone using our photographs, and then tell the world your opinion, not before. We can then compare our tracings with yours, or vice versa, and we will then have a common ground for discussion. 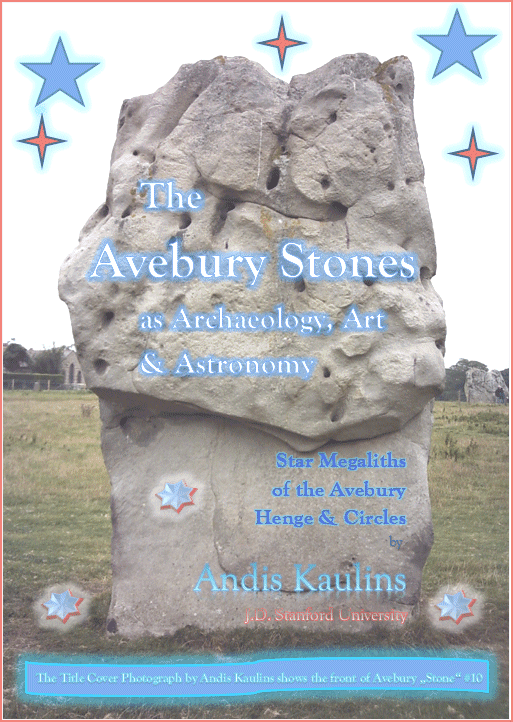 This was the first posting of a series of postings presenting selected aspects of a book soon to be published as The Avebury Stones as Archaeology, Art & Astronomy by Andis Kaulins, CreateSpace, USA, Title ID: 6429513 ISBN-13: 978-1535338028. This posting introduces a series of postings deciphering the Avebury Stones. It is the best archaeological piece we have read in decades and it provides a balanced perspective on how to view studies of the human past. What follows below is our own take on how to view the past for our work. Many thousands of years ago, before the appearance of modern-day religions and sects, and before the advent of modern lighting, humans sat around their evening campfires and gazed up at the vast expanse of the starry night sky. The few lucky persons living today who have seen the stars at night at a desert location free of city lighting know just how spectacular the Milky Way can appear as it spans the heavens. In an age where the term "awesome" is overused .... the MILKY WAY IS AWESOME, and was even more AWESOME for our distant ancestors, who did not have our modern astronomical knowledge. What DID they know about the sky above? How did they view their heavens? How did they integrate that knowledge into their culture? Who created all this? if it was created at all? A good argument can be made that the ancients had better answers than we do in our contemporary world, given their prehistoric state of knowledge. As we also do today, the ancients sought answers in the heavens true to the hermeticism of Hermes Trismegistus, "as above, so below". The sky was the presumed abode of the gods in ancient eras. Nothing much has changed in the interim. For modern monotheistic religions, "God" also resides "up there". We allege that such an "astronomical" belief goes back into prehistoric times. How did our forefathers see the sky of stars in detail? We are so used to living in a world dominated by the written word that we have lost sight of what it must have been like for prehistoric humans to confront their world without the tools of alphabetic or syllabic writing. What is it that we see above at night (not knowing what the stars were)? How does the night sky relate to the day sky? Why do the Sun, Moon AND Stars show numerous "regularities"? We can see in our minds eye the shadows of ancient humans tracing figures in the ground with sticks as they discussed their various ideas about who they were, where they were, and what the sky above them was, and how it worked. Humankind is never at a lack for answers -- be they right or wrong -- and so it was that some theories and ideas about the sky soon prevailed, all based on observations made with the naked eye (though there is evidence that the ancients may early have discovered the principle of lenses while glassmaking). Such theories fulfilled a need, even if they were less sophisticated than today. What astronomical events did they observe? How did they interpret what they saw? How was this knowledge communicated to their peers or community? At first, such "knowledge" was passed on orally, but explaining things with a stick surely led to "picture writing", to carvings on stone, and to rock art. "Picture writing" was to the ancients what "alphabetic writing" is to moderns. "simple, unaffected and unsophisticated ... characterised by childlike simplicity of execution and vision". "Naïve art does not necessarily evidence a distinct cultural context or tradition. Naïve art is recognized, and often imitated, for its childlike simplicity and frankness. [Naïve art has] a flat rendering style with a rudimentary expression of perspective. When ... emulated by a trained artist, the result is sometimes called primitivism, pseudo-naïve art, or faux naïve art." The above descriptions in fact reflect well our traced, colored astronomical decipherments of the Avebury Stones as they appear in subsequent postings. We do our best to accurately portray the prehistoric style of art we have found, which draws figures within figures within figures in a simple manner. Please be aware that the style of art on the Avebury Stones portrayed in our postings is by no means "our creation" as such. Rather, to the best of our ability, the style seen is intended to reflect the art of the ancients. To remove further doubt, we had an exhibition of our own art works quite some years ago, and our own paintings are quite distant from naive art.